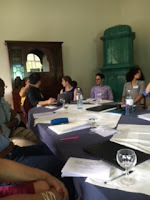 I had the opportunity to experience a unique community of people whose insights and knowledge I would not have been exposed to without attending the Salzburg Global Seminar Session 565 Better Health Care: How do we learn about improvement? The Seminar connected me to a high caliber of thinkers who come from such rich backgrounds. Learning in this collaborative environment pushed me to think of my work in a different and more meaningful way. I am taking away many lessons that can be applied to the community I am from and work. The quality improvement process is complex by nature as it involves many dynamic components. The role of context and the importance of iterative adaptive learning should be taking place. In public health we talk about the defining role environment makes in a person’s health choices and outcomes. Where someone lives, works and plays is most impactful on health outcomes. The same can be said about the quality improvement work. The role of leadership, team work, engagement of key stakeholders creates the context which quality improvement work will be successful. There are many new tools that I can add to my toolkit, including formative evaluation. Formative evaluation encourages the team creating change to assess throughout the quality improvement work and make changes based on results. Looking at logic models and theory of change as living documents that should change as the work progresses and evolves drives the team to successful outcomes. The International Fellows and Scholars Program office is proud to administer a university-wide program that awards fellowships to outstanding residential mid-career professionals to attend a session at the Salzburg Global Seminar through a grant from the McKnight Foundation. The Salzburg Global Seminar convenes imaginative thinkers from different cultures and institutions, organizes problem-focused initiatives, supports leadership development and engages opinion-makers through active communication networks, all in partnership with leading institutions from around the world and across different sectors of society. Sessions average about five-days supporting the mission of the Seminar to challenge present and future leaders to solve issues of global concerns. Beginning in 1947, the Salzburg Global Seminar has convened more than 25,000 fellows representing more than 160 countries. The Seminar welcomes applications to its annual programs which bring together approximately sixty distinguished international participants including emerging leaders, known as "Fellows" from government, business, academia, and nongovernmental organizations. The sessions are cross-sectoral and cross-cultural in approach, with the objective of broadening and deepening perspectives to promote informed action and far-sighted decision making among key professionals worldwide. Particular emphasis is placed on generating cutting-edge ideas and on developing proposals for action. The International Fellows and Scholars Program office is accepting applications for a limited number of full or partial scholarships to attend sessions that are available based on certain eligibility criteria. Please visit the Seminar’s website at www.SalzburgGlobal.org for additional information about the sessions.